Batman has an attention to detail that’s unmatched by any other Super Hero. From the Utility Belt to footwear, each piece he wears is well-crafted equipment to get the job done. Perfecting your own Super Hero style requires a similar level of attention to detail. Heading off to an evening out on the city without the proper attire is a recipe for disaster, which is why it’s imperative to polish your look with these Dark Knight suit pants. Made to match the Dark Knight suit jacket, these suit pants are constructed of polyester and help whisk your look into the realm of Super Heroes. 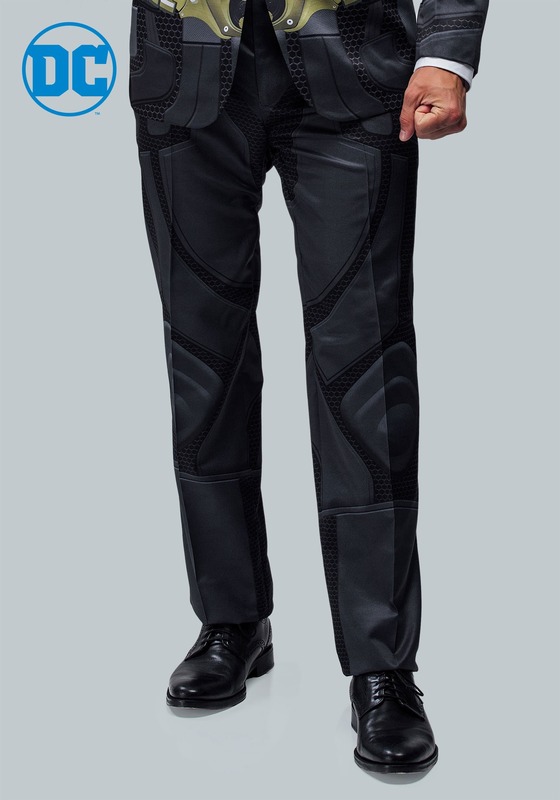 The pants are inspired by the Dark Knight Trilogy and has armor printed on the exterior, successfully combining the fit of suit pants with the style of the Batsuit. They fasten with a zip fly and hook-and-bar closure, providing a comfortable and secure fit. These suit pants won't protect you from gunshots and blades, but they will guarantee that you're the best dressed man in the room!